This one is definitely a goldie. I suppose this might be a little sappy but I don’t really care, I can be a real softy. This is my good friend Loran (left). I have known her for six years but it seems we have been friends for a lifetime. She is supportive, honest, sincere, an incredible athlete, a wonderful mom and wife and just plain fun to be around. 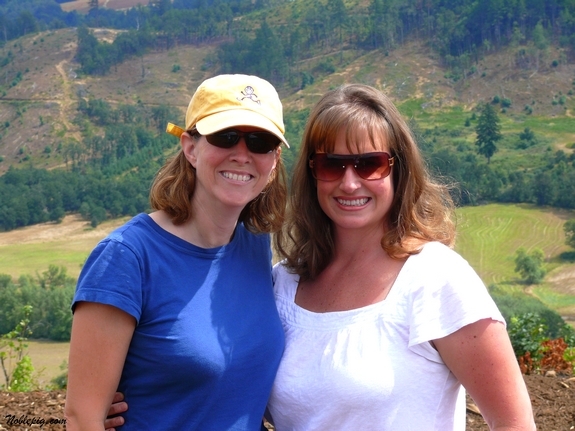 She cheered me on during my viticulture & enology studies and listened to every story I told about this beautiful vineyard property we found in Oregon. It was finally a pleasure to show her and her family the part of our lives we have worked so hard for and talked relentlessly about. It was surreal to have them there hiking around as if nothing had changed and we had never moved away. Our kids were pretty excited too. 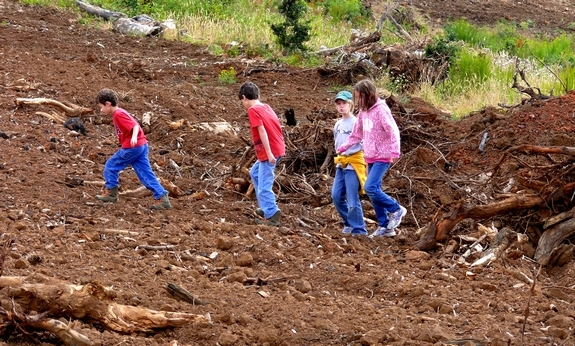 This is a child’s wonderland…sticks, dirt and rocks. 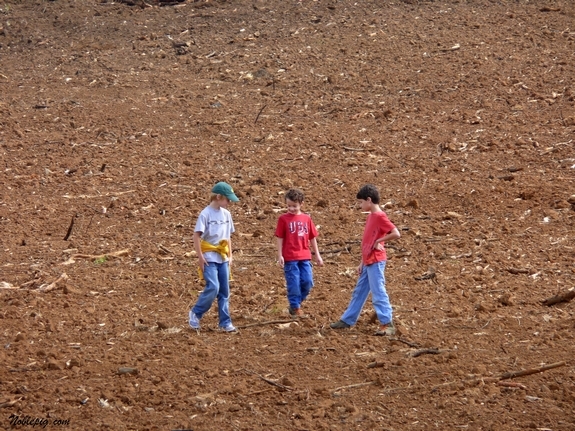 They hiked around, explored and couldn’t get enough of all the open space around them. They made memories that will last a lifetime. Thanks for coming by guys, we had a blast. We had friends like that when we had children the ages yours are, and we are still very, very good friends with them, as our children are with theirs! Our lives are intertwined in ways that matter. Friends like this are without price, and I hope they are as much a blessing to you as you to them…and as the friends we have. And one day we hope to travel with these friends the short distance south to Pinot Noir country in Oregon together to visit you and yours,to sample the rewards of your great adventure and calling , wine! That she can celebrate your achievements and share your passions with you is a terrific testament to a life long friendship. I have a few of those and I wouldn’t trade them for anything. There is NOTHING like a good friend. There’s nothing like spending time with old friends. Your property is sooo beautiful, Cathy. Looks like the kids are having a great time. Happy times make for great stories and a favorite memory, for everyone. Beautiful memories. So nice to have friends like that! Is that gorgeous country or what??!! I’m so jealous, here in flat Texas! Beautiful pictures! Everyone should have friends like that. Good friends really are golden! Great photos! What a fun place for kids to play around! So very glad you got to have some wonderful time to spend with good friends. Love the photos!! It’s beautiful. Beautiful, beautiful, beautiful…you both and the adorable children! That is wonderful Cathy, I am glad you have a good friend like Loran. 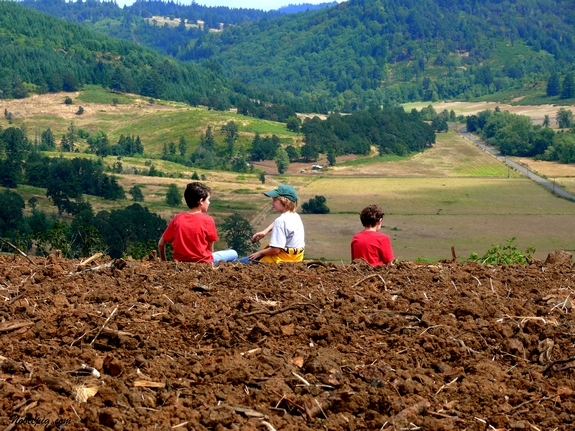 Children seem to be happy and enjoy the beautiful view. OK just one question, sappy? Not in the least. How awesome to have good friends and celebrate a very big milestone in your lives! Your becoming a real country woman and it’s cool when you share something personal. I am very proud of you. This is a huge project and you are going to be a success at it too, I have NO doubt. My friends you look beautiful! I am so glad you had a super visit! 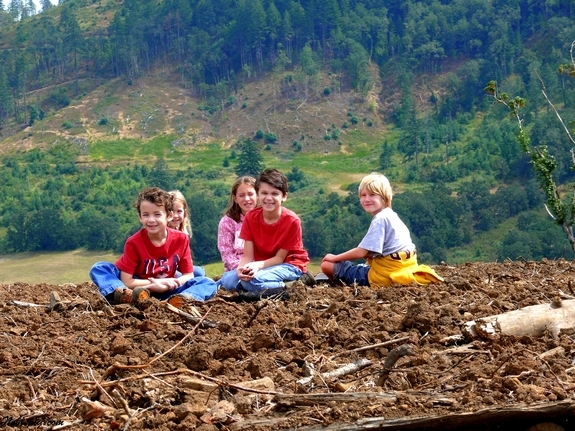 The kids looks so cute walking around on your property! Miss you! What an incredibly beautiful place you have there. I would love for my children to grow up in a place like that. So glad you and your friend had a wonderful visit! Not sappy at all – the more I read your blog, the more evident you’ve got your priorities right on track. I get mushy when I talk about my dear friends too. I am in awe of the beautiful views from your vineyard. I can’t wait to come for a tasting when you are open. I’m so glad you got to touch base with a good friend. It sounds as though it was a great visit. On a more crass note, your property is drop dead gorgeous. not only is your property drop dead gorgeous, so are you!!! Thank you from my family for the pasta pie recipe. It is a non-negotiable item at every family function. delish!! Great that you have such a good friend. Beautiful pictures and a great story. This blog is a pleasure to read, because I never know what you are going to write about next! This one was superb. Genuine friends seem hard to come by. They are a precious blessing, aren’t they? That is some beautiful country you’ve moved to. Can’t wait to see more pictures of it. Hey Cathy … wow I’ve missed checking in with you this summer. I took a blogging break and didn’t look back. It’s been a fun, yet busy summer. But I do miss all my wonderful blogging buddies. I’m so glad to see you’re settling in on the new property. And once again, looking back at some of the recipes I’ve missed, I’m drooling all over the computer. Snickerdoodle ice cream … will make me a hero! Oh … saw Julie and Julia yesterday and it made me think of you. Great movie! Ok … take care … I’ll try and check in more frequently, but my summer doesn’t officially end until after Labor Day. Blessings to you! Love Love Love this post. Thanks for sharing. Aww! Don’t you love good friends like that? Awwww It does look perfect for children. I mean, I remember how awesome it was for me to spend some days in the country side when I was a kid… everything seems so big and wild! How wonderful to spend time with such good friends! Beautiful pictures! Tributes to friends like that are just right, never sappy. 😉 Isn’t it amazing how you quickly pick up with your buddies as if time never passed and then almost as soon as they leave, you miss them terribly and your latest get together seems like long ago?